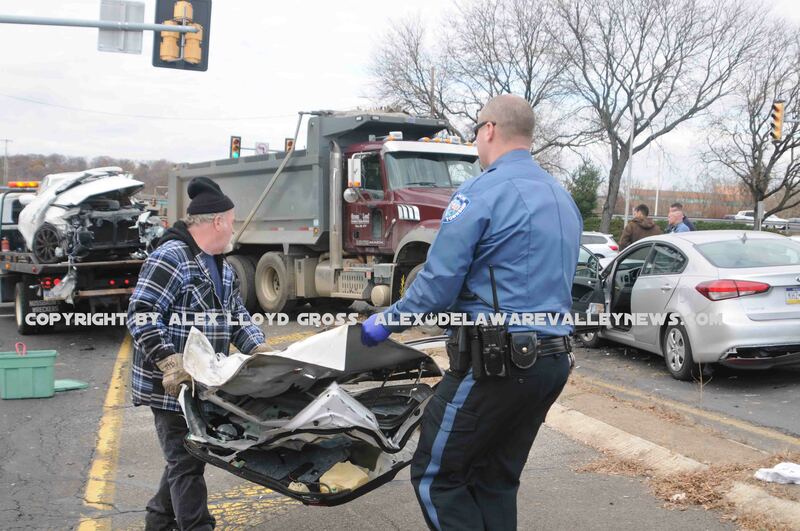 Alex Lloyd Gross photo- Delaware Valley News.com police help remove part of the wreckage to get the road open. Three cars and a dump truck were involved in a serious crash on the Route 1 exit to Rockhill Drive in Bensalem . The wreck happened today, November 20, 2018 just before noon. One person was tapped in a vehicle that made contact with a dump truck belonging to a landscaping company out of Fairless Hills Pa.. The person in the car was in their vehicle for about 20 minutes before they were freed by Bensalem and Trevose firefighters. None of the injuries is said to be life threatening. Police said no citations will be issued until the investigation is complete. The crash happened when one of the vehicles disregarded a red light while going through the intersection. All of the vehicles involved had to be towed away. Rockhill Drive in front of the Neshaminy Mall was closed in both directions for about 90 minutes, while the vehicles were removed. The northbound exit to Rockhill Drive from Route 1 was also closed to traffic. At least two people were taken by ambulance to local hospitals.